The speech might be free, but the bail costs money. 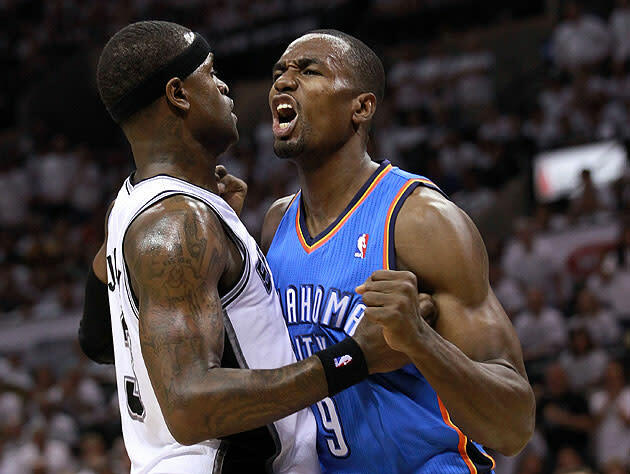 San Antonio Spurs swingman Stephen Jackson has been slapped with a $25,000 fine "for issuing a hostile statement directed to Serge Ibaka in a Twitter message," the NBA announced Sunday. The announcement by NBA executive vice president of basketball operations Stu Jackson followed a Sunday statement issued by the Spurs organization condemning the 34-year-old guard/forward, who has played for seven teams during a 12-plus-year NBA career. "The recent public comments made by Stephen Jackson are absolutely unacceptable, can not be tolerated and do not reflect the standards held by the San Antonio Spurs," Spurs general manager R.C. Buford said in the statement. Those "public comments" came Friday night, following the Oklahoma City Thunder's nationally televised 114-108 win over the visiting Los Angeles Lakers. Late in the fourth quarter, Thunder forward Ibaka and Lakers forward Metta World Peace got a little bit physical with one another while battling for rebounding position following a free throw. There was grabbing of jerseys, blowing of whistles and separating by teammates; beyond that, as ESPN color commentator Jeff Van Gundy said, "That was nothing." Somebody tell serg Abaka. He aint bout dis life. Next time he run up on me im goin in his mouth. That's a promise. He doin 2 much. 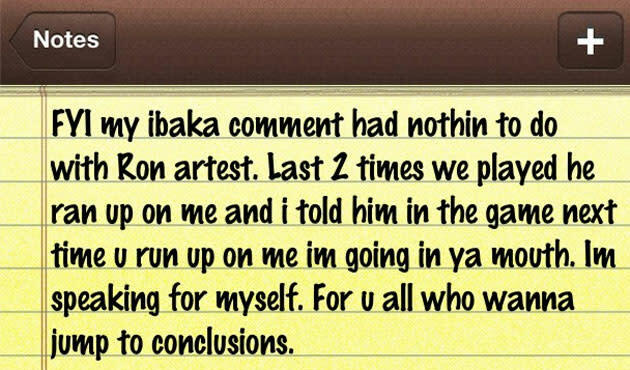 FYI my ibaka comment had nothin to do with Ron artest. Last 2 times we played he ran up on me and i told him in the game next time u run up on me im going in ya mouth. Im speaking for myself. For u all who wanna jump to conclusions. OK, so the tweet wasn't Cap'n Jack coming to Ron-Ron's defense in a much more digital, much safer manner than he did lo those many years ago — this is just him saying he intends to punch Ibaka in the mouth of his own accord, for personal reasons. Got it. Still: This is Stephen Jackson saying he intends to punch Serge Ibaka in the mouth if Ibaka crosses some kind of line the next time the two share the court, which is the kind of thing that the NBA tends to notice — especially when it comes hours after an interview is published in which Jackson makes a pretty compelling argument for why, in a very specific context, it might feel kind of good to punch a fan in the face. This is probably just a little too much talking about punching for the tastes of both the NBA and the Spurs. Hence, the Spurs' rumblings about discipline to come — which Jackson shared in another Instagram note ("Looks like ima get fined for my comments. What happened to freedom of speech.") — and the subsequent $25,000 fine. As The Associated Press notes, it remains "unclear if Jackson faced additional punishment from San Antonio in the wake of the NBA fine" — in Buford's statement, he said the Spurs' fine of Jackson "will be imposed in consultation and coordination between the Spurs and the NBA," so it's possible additional team-levied penalties could be forthcoming. If so, that's a pretty expensive tweet, man. 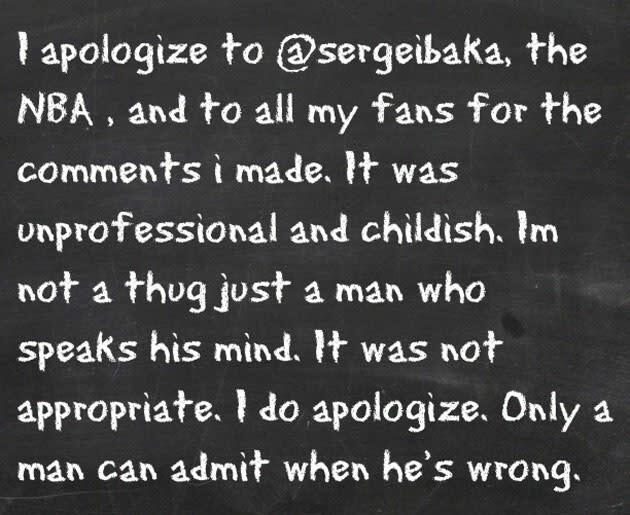 I apologize to @sergeibaka, the NBA, and to all my fans for the comments i made. It was unprofessional and childish. Im not a thug just a man who speaks his mind. It was not appropriate. I do apologize. Only a man can admit when he's wrong. When pressed lightly on the subject, Ibaka literally held both hands up and said, "I don't want to think about it." All told, the incident leaves Jackson (at least) $25,000 lighter in the wallet — although he might have already budgeted for just such an occasion — and perhaps makes NBA fans a bit more aware of how some players tend to view the chest-pounding-and-yelling histrionics to which players like Ibaka and others can be prone after making big plays. It will also likely offer a sideline conversation piece when the Spurs and Thunder — each now sporting league-best 17-4 records, though San Antonio took Round 1 back on Nov. 1 — match up again on Dec. 17, one week from today. Jackson could be back from the fractured right pinkie finger that's kept him out since Nov. 20; if so, expect this Twitter interplay to get much more TV play. • Do great NFL teams still exist in a parity-filled league?